The chosen sites are: the Eiffel Tower in Paris, Rome's Colosseum, the new Marina Bay Sands in Singapore, Peru's Machu Picchu, the Taj Mahal in India, the Great Sphinx and Pyramids in Egypt, Israel's Old City (including the Dome of the Rock, the Redeemer Church of the Holy Sepulchre and the Western Wall), Tokyo's Senso-ji Temple, the Sydney Harbor Bridge in Australia, the Great Wall of China, and last but not least, Philadelphia's Liberty Bell and Independence Hall. We identified eight artists to create original paintings of each of these sites, which are currently hanging in Alter Hall's first-floor Jazzman's Cafe. 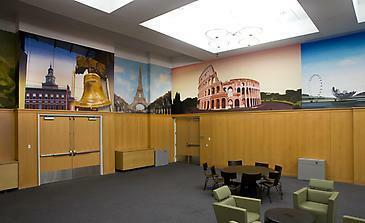 We worked with local printers to turn the original paintings into the impressive nine-feet high and twelve- to twenty-two-feet long murals that now line the upper walls of Alter Hall's MBA Commons. "Sydney Harbor thrusts itself onto the landscape with drama and wonder. Sky and water are tethered through the dynamic reaches of concrete and steel. Charting that drama through paint becomes the study of humanity’s attempt to bridge into the majestic." "While choosing the image with which to work, it seemed to make most sense to meet somewhere in between my curiosity with Chinese landscape painting and the Western approach to landscape. The goal of the process is to use a paint layering system that will produce a kind of atmospheric, distant experience. I want something both known and ambiguous simultaneously happening within the image." "The Taj Mahal is at once opulent and meditative. I choose to the use a portal view from one of the two mosques on either side of the Taj Mahal to frame the composition and to give the viewer a sense of place. I explored the symmetry of the architecture, the decorative floral motifs and the meditative quality found in the linear perspective and reflective pool." "I have always had an abundance of city pride, so I was thrilled to be able to depict Philadelphia for this project. The Liberty Bell has always seemed to me an apt symbol of my city. Like the Bell, Philly's greatness is not in its perfection and it is no less beloved for it." "I can think of no better symbol of Rome than the iconic Colosseum, one of the greatest marvels of Roman architecture and engineering. Historically a venue for all manner of spectacle, today it itself is the main attraction. I was especially drawn to the juxtaposition of the aged structure with the accessories of its current use as a tourist venue." "The highly urbanized Singapore, with its robust tourist and market-based economy, is aptly represented by this star-chitect designed casino and mega-resort which sits near one of the busiest ports in the world. Paradoxically, its very recent construction makes it all the more representative of a rapidly developing Asia." "I chose to paint the Eiffel Tower because I have always loved towers and tower construction. I wanted this piece to be about wood and paint and fusing the two into the nature of the tower while tipping my hat to the various artistic traditions we associate with Paris...especially the Impressionists." "I had the great fortune of visiting Machu Picchu in the summer of 1999, during a difficult time in my life. After a five-day hiking trek through the Andes, and just as the sun began to rise, I came upon the breathtaking and enigmatic ruins. It was one of the most transformative experiences I have had." "This painting of Jerusalem incorporates ancient architecture that holds sacred meaning to Christians, Muslims and Jews: the Dome of the Rock and the Western Wall. Considered divine by so many for thousands of years, and yet a site of intense conflict, the painting represents a renewed hope for harmony and tolerance among its peoples." "The Great Pyramids and Sphinx are part of our collective visual consciousness, though many of us have never been to see this landmark in person. The detail evident in a photograph taken miles away is just another example of the grandeur and unfathomable human exertion put into this landmark. In my painting, I hope to honor the miraculous and regal structures that emerge out of the golden desert under a solid blue sky. As a landscape painter, this was a perfect match for me. I naturally look at subtle changes in light and shadow to construct my spaces, and this was no different. I welcomed the challenge of making a seemingly limited palette limitless, hopefully slowing the viewer for a moment to take in a glimpse of what he or she may never see in the flesh - if only through this painting." "In Tokyo my goal was to represent the Japanese metropolis as a skyline including the old Asakusa Kannon temple, the large red Sun (evoking the Japanese flag), and the emerging high-tech network that links the temple, the Sun and the entire environment into an organic hub of global interaction."